Preventing data breaches could be one of the most important things your bank or financial services firm could focus on. Here are the reasons that data breaches should be a major focus. Banks are increasingly targeted by hackers hoping to steal valuable data. Despite high threat levels and widespread knowledge of risks, many financial institutions find themselves underprepared. There are many reasons to focus on preventing data breaches, continue reading to find out a simple way Cybriant can help. Financial services firms fall victim to cybersecurity attacks 300 times more frequently than businesses in other industries. To make matters worse, the costs for financial institutions to repair these incidents are often far greater, which is problematic as the average data breach cost rose 5 percent to $7 million per breach in 2017. The average cost to U.S. businesses per record, lost or stolen, during a breach was $225 – compare that to the financial industry’s number of $336 per record and you can clearly see the issue. Moreover, according to our own research studies, consumers at this point actually expect their financial service providers to offer services that reduce the chance for exposure and, as importantly, quickly rectify the situation if their data does become compromised. Of the consumers we surveyed, 50 percent said they want their bank to offer these services and 43 percent felt the same about credit unions. Since a data breach leads to a loss of customer faith and market reputation, it’s critical that financial institutions, including banks, protect their networks. Here are three things banks need to know about network security standards and preventing data breaches at financial institutions. IT staff need to be able to respond to threats, and banks that tighten the budget on IT spending cripple this mission. Unfortunately, some banks reduce IT budgets to free up more money for customer-facing web tools and apps. This move short-circuits IT’s ability to defend against a cyber attack. Banks must take threats seriously, and this means adopting stricter network security standards and adequately funding IT departments for cyber monitoring and defense. If your clients find out that you are preventing data breaches to secure their investment, they may find a new bank. Two-factor identification offers superior protection, but many employees dislike having to verify their identity using another method. Single-factor identification for apps and password-protected portals leaves banks vulnerable to an attack when cybercriminals have stolen legitimate user credentials. Hackers are using more sophisticated and creative methods to easily steal login credentials. Once they have credentials, they can penetrate the system without raising any alarms. Banks must ask themselves which is worse: the pain of having to log in via two-factor authentication or the pain of a serious data breach? Two-factor authentication can thwart attacks. Given the low cost of implementation, it’s a no-brainer. You may even consider multi-factor authentication to ensure preventing data breaches. Third-party apps promise a shortcut for financial institutions that don’t have the time or money to develop their own app, but there is a safety risk here. In the race to keep up with the competition, some banks are adopting apps that may not be up to security standards. The short-term attempt to stand out can backfire big when apps are penetrated. No matter the perceived need to offer customers apps and online tools, there is no excuse for failing to do due diligence when it comes to security standards or compliance requirements. Approving the app to appease the staff opens up the bank to a data breach through a third-party app. To address the security gap, banks should take a two-pronged approach: First, adopt stricter policies that target weak apps and second, ensure all apps are monitored for cyber threats. When hackers see that a bank is not an easy target, they will look for a financial institution that has unguarded access points. By addressing these security vulnerabilities, banks can reduce their risk and continue preventing data breaches. You need to start with a cybersecurity strategy and framework. We recommend the NIST Cybersecurity Framework and have written several articles on how to use a framework in all your decision making. Once you have the framework in place, focus on your compliance needs and risk reduction. We have create a tiered service that can not only make that efficient and affordable, it can actually make cybersecurity and preventing data breaches easy. Are you prepared to defend your entire organization against the bad guys? Check out our list of cyber security monitoring tools to be sure. Cyber Security Monitoring is a huge responsibility for every business no matter the size. You must be prepared to defend against malware, hackers, internal sources, and so much more. SIEM is one of the ultimate cyber security monitoring tools and collects data in multiple ways from your system or network, including your existing security appliances. Your SIEM gives us a “Big Picture” of your all security events. With the right security experts monitoring your SIEM, you’ll know when and where an event occurs. Managed SIEM is included in PREtect CORE. Find out more here. There are many free research tools available to research cybersecurity threats that are effective cyber security monitoring tools. The key factor is that the person doing the research needs to have a comprehensive knowledge of all the pieces involved. AlienVault Open Threat Exchange is the neighborhood watch of the global intelligence community. It enables private companies, independent security researchers, and government agencies to openly collaborate and share the latest information about emerging threats, attack methods, and malicious actors, promoting greater security across the entire community. Of all the cyber security monitoring tools available, having a trained expert on your team could be one of the most critical. A common mistake we see is when organizations add cyber security monitoring to their overstaffed IT team’s plate. Untrained employees aren’t able to resolve cyber security issue immediately or even know what to look for. At Cybriant, we recommend outsourcing to a professional cyber security monitoring company like us. The Cybersecurity experts on our team are professionals who have attained specialized in-depth expertise and proven knowledge in the essential areas of proactive cyber threat detection and mitigation. Our cyber security experts act as an extension of your IT team, understand your infrastructure, and are ready to defend your network. Due to the increase in internet-based services, the size of network traffic data has become so large and complex that it is very difficult to process with the traditional data processing tools. Cyber security monitoring is a major problem for organizations that have a large amount of network traffic. Fast and efficient cybersecurity intrusion detection is a very challenging problem due to big and complex nature of network traffic data. A realistic cybersecurity intrusion detection system should be able to process large size of network traffic data as fast as possible in order to detect the malicious traffic as early as possible. Cybriant helps defend your network through our tiered PREtect services. Find out more at PREtect: cybriant.com/pretect. The Disassembler is a program that converts machine code into the low-level symbolic language that can be read by the human. The disassembler is a reverse engineering cybersecurity monitoring tool. Traditionally it was applicable only on hardware but now also used for software as well. Disassembler, reverse engineering can be used to identify the details of a breach that how the attacker entered the system, and what steps were taken to breach the system. There are different tools to work on the path of a disassembler, which is Apktool, IDA and Dex2jar etc. are major ones. Any organization that is serious about their cyber security will have a thorough understanding of their current Mean Time to Detect and Mean Time to Respond metrics. MTTD and MTTR are vital cyber security monitoring tools. Meantime to detect is the amount of time it takes your team to discover a potential security incident. Meantime to respond is the time it takes to control, remediate and/or eradicate a threat once it has been discovered. A team of experts should review security events on daily basis and you should concern to reduce mean time to detect risks. When you detect risk then you need to immediately resolve this matter and reduce mean time to respond also. The core metric for many security teams to measure their effectiveness is in Mean-Time-to-Detect and Mean-Time-To-Respond. Once your security team identifies or detects a threat and creates an alert, it then becomes a matter of how much time is spent on containing and remediating the threat. No matter the size of your organization, we can probably guess that your employees aren’t trained well enough on cybersecurity and IT security. Hackers are getting increasingly good at recreating emails and personalizing for your employees. How can you effectively train your employees? It should come from the top down. Make security a priority in your organization. There are different online platforms which are offering basic courses for employees training. KnowBe4 allows your organization to “phish your users” so you will know who the most phish-prone employees are and which ones should receive the most training. Many organizations think that their antivirus software is enough to keep them safe. Unfortunately, that’s not always the case. Antivirus isn’t enough to protect endpoints. The underlying technology for Cybriant’s Managed EDR service is the only technology that stops over 99% of advanced threats and malware before they can execute to cause harm. It completely eliminates the need for legacy antivirus software, anti-exploit products, whitelisting solutions, and host-based intrusion detection and prevention systems. Privileged identity management is also a key cyber security monitoring tool. PIM is highly recommended by cybersecurity experts that by this specific passwords are save in specific software. When any hacker is trying to hack a company’s website or data then PIM deceive attackers by changing passwords immediately. Due to this confidential data protected from stealing by attackers. PIM is also cost-effective and you can save your money. Patch area codes which are basically used to update the software of your company to get the latest versions which are more effective. Responsive Patch Management solution will scan your systems, check for missing and available patches against our comprehensive vulnerability database, download and deploy missing patches and service packs, and generate reports to effectively manage the patch management process of the enterprise. Patch management is simply the practice of updating software with new pieces of code which is more effective for cyber security monitoring. This service is included in PREtect ADVANCED. Find out more at cybriant.com/PREtect. Insider threat detection is also the main problem to face today. In this matter, you should take care of your employees. You should detect threats from inside because some malicious users who access private information and want to steal this. There are some negligent users who not voluntarily expose data but due to their negligence data can be exposed to outers by which company loss protection and some private/confidential files. Vulnerabilities are related to dangers or risks which our networks face or in emergency condition affected by some malware. So, for this purpose, you should examine your network to find risks and their solutions. Confidently visualize, analyze, and measure your cyber risk vulnerabilities is a tool for reducing cyber risk. Identifying vulnerabilities and having a system in place to patch will be incredibly effective cyber security monitoring tools. Hacking is easy. And profitable. An average phishing attack could potentially cost a mid-sized organization $1.6 million. Phishing is just one of the many ways that an organization can be attacked or breached. Let’s talk about the top 5 most common network security threats. While we typically think of email as the main source of social engineering, hackers can gain your trust through phone, email, snail mail, or direct contact. The intention is to gain access to a system that would be too difficult for them to hack into. See the KnowBe4 article, “What is Social Engineering” for a more detailed look into those techniques. 1 in 131 emails contains malware. 4,000+ ransomware attacks occur daily. The number of Phishing Attacks increased 65% last year. phishing attack costs a mid-sized company $1.6 million. 47% of attacks in 2017 caused by phishing. Many organizations confuse Vulnerability Management and Vulnerability Scanning. Performing only a single vulnerability scan each year or quarter puts organizations at risk of not uncovering new vulnerabilities. The time between each scan is all an attacker needs to compromise a network. With continuous scanning, our security experts automatically have visibility to assess where each asset is secure or exposed. Today, security professionals find themselves chasing the “threat of the week,” often to no avail. Racing ahead without context and prioritization results in reactive firefighting and pursuit of the wrong issues. Performing the security basics well demands insight and focus. Fortunately, vulnerability remediation doesn’t always have to be performed overnight, although the highest risk issues should be addressed quickly. According to a comprehensive assessment of global data breach statistics, 99.9 percent of the exploited vulnerabilities were compromised more than a year after the common vulnerabilities and exposures (CVE) was published. 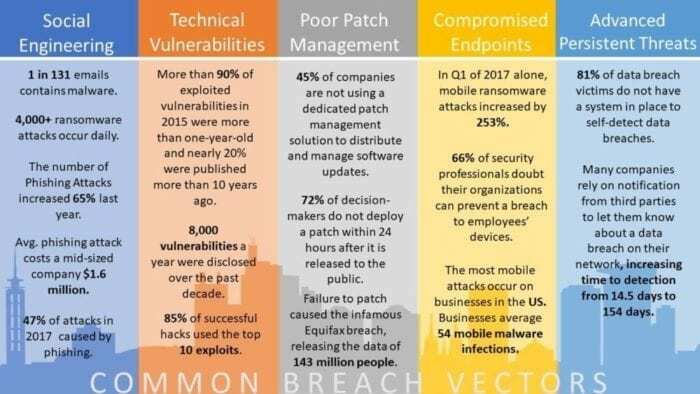 In other words, if organizations would patch their vulnerabilities in less than a year, they could improve their chances of preventing an exploit-initiated data breach by as much as 99.9 percent. More than 90% of exploited vulnerabilities in 2015 were more than one-year-old and nearly 20% were published more than 10 years ago. 8,000 vulnerabilities a year were disclosed over the past decade. 85% of successful hacks used the top 10 exploits. A proper patch management plan will help your organization find missing security patches, support multiple systems and platforms, and handle increased compliance restraints. Compromised endpoints have become much more common in the mobile-era that we live in today. BYOD means that employees are connecting their own devices to a corporate network. While this helps an employee’s productivity, it may cause problems for an organization’s network since corporate policy may not be enforced on the device. This threat is very closely related to common network security threats – social engineering. That is because many compromised endpoints are caused by social engineering including phishing attacks that cause an end user to download malicious software onto their devices. What is the risk of letting malware execute? Download our ebook: Prevention vs. Detect and Respond. In Q1 of 2017 alone, mobile ransomware attacks increased by 253%. 66% of security professionals doubt their organizations can prevent a breach to employees’ devices. The most mobile attacks occur on businesses in the US. Businesses average 54 mobile malware infections. An advanced persistent threat is a set of stealthy and continuous computer hacking processes, often orchestrated by a person or persons targeting a specific entity. An APT usually targets either private organizations, states or both for business or political motives. APT processes require a high degree of covertness over a long period of time. The “advanced” process signifies sophisticated techniques using malware to exploit vulnerabilities in systems. The “persistent” process suggests that an external command and control system is continuously monitoring and extracting data from a specific target. The “threat” process indicates human involvement in orchestrating the attack. APT usually refers to a group, such as a government, with both the capability and the intent to target, persistently and effectively, a specific entity. The term is commonly used to refer to cyber threats, in particular, that of Internet-enabled espionage using a variety of intelligence gathering techniques to access sensitive information,but applies equally to other threats such as that of traditional espionage or attacks. Other recognized attack vectors include infected media, supply chain compromise, and social engineering. The purpose of these attacks is to place a custom malicious code on one or multiple computers for specific tasks and to remain undetected for the longest possible period. Knowing the attacker artifacts, such as file names, can help a professional make a network-wide search to gather all affected systems. Individuals, such as an individual hacker, are not usually referred to as an APT, as they rarely have the resources to be both advanced and persistent even if they are intent on gaining access to, or attacking, a specific target. 81% of data breach victims do not have a system in place to self-detect data breaches. Many companies rely on notification from third parties to let them know about a data breach on their network, increasing the time to detection from 14.5 days to 154 days. According to the FBI, business email compromise (BEC) alone cost businesses worldwide over $5 billion from 2013 to 2016. Here’s the disconnect: phishing skirts technology by targeting human beings. That’s why it’s critical to educate employees to recognize and report all manner of phishing attacks. While each common network security threat has its own individual process for prevention (or elimination), some of the threats are closely related. For example, organizations typically categorize vulnerability management and patch management in the same sentence. That’s because if you find a vulnerability, you want to patch it immediately, but those are different services. Similarly, social engineering can cause compromised endpoints. But, your organization should have a way to maintain one and alleviate the other. This is why we created Cybriant PREtect. Cybriant PREtect integrates five essential security controls delivered as a single subscription service. With each integral service, PREtect will help your organization combat each of the top 5 common network security threats. These services are available individually, but when these services are delivered together they harden your organizations’ computing environments and significantly help reduce the risk of loss due to breach. PREtect ensures a sound security posture as well as compliance with government regulations and industry best practices for effective information security. Reducing your threat landscape: We targeted the top 5 common cyber breach vectors mentioned above and bundled services that will reduce your risk of loss due to breach. Building a solid security foundation: Our services are based on the NIST Cybersecurity Framework which consists of standards, guidelines, and best practices to manage cybersecurity-related risk. Speeding time to business value: We have the expertise, data, processes, etc. to make your security tools work at peak efficiency. More info at cybriant.com/pretect. Two-thirds (66%) are more up-to-date with patching than they were previously. Half (50%) say that they are now using threat intelligence more regularly, to stay ahead of emerging threats. In addition, 58% carried out a review of their organization’s cybersecurity posture following the attacks. While these cyber attacks have affected the current roles of IT professionals, only 14% of respondents say that their budgets for cybersecurity have increased. And only 16% of those respondents say believe that their bosses and company boards have taken a greater interest in their roles. 300,000 computers were infected across 150 countries. Cyber risk modeling firm Cyence estimates the potential costs from the hack at $4 billion, while other groups predict losses would be in the hundreds of millions. The US and UK assert that North Korea was behind the attacks. Designed to spread quickly, and targeted complete energy companies, the power grid, bus stations, gas stations, the airport, and banks. The attack has cost companies an estimated $592.5 million in revenue based on figures from U.S. Securities and Exchange filings and investor statements. That total includes money lost in quarterly and yearly revenue as well as financial and operational losses brought on the attack. We even put these services in one integrated solution: Cybriant PREtect. Learn more about this affordable, subscription-based model at www.cybriant.com/pretect.